An Eagle is spotted down at the side of the road. The story can be read HERE. i get the report that there is an Orca beached at Grassy Point! The story can be read HERE. Was still sipping coffee in my nightgown when the phone rang. i was expecting it to be my brother, so when the woman said she was Charlie from NIWRA, it took me a bit to snap out of my confusion. Turns out it was Tawny from NIWRA. She is the sister in law of my Hornby friend. She used to do a lot for the Saltspring rescue, IWNCC, even though she lives on Vancouver Island. Now she is the Animal Care Manager for NIWRA. She approached me at a thanksgiving meal being held at the Community Hall, to ask if i would be her Hornby go-to person. i said, of course i would. The first call i got from them was about the Raven down. So, Tawny was calling me to see if i would go check out an Eagle that was spotted down beside the road near Phipps Point. i said of course i would. i called Aaron, he said he*d come over, then i gathered the rescue gear. i had some time to putz around in the yard til he showed up. We loaded the gear in his truck & headed down there. 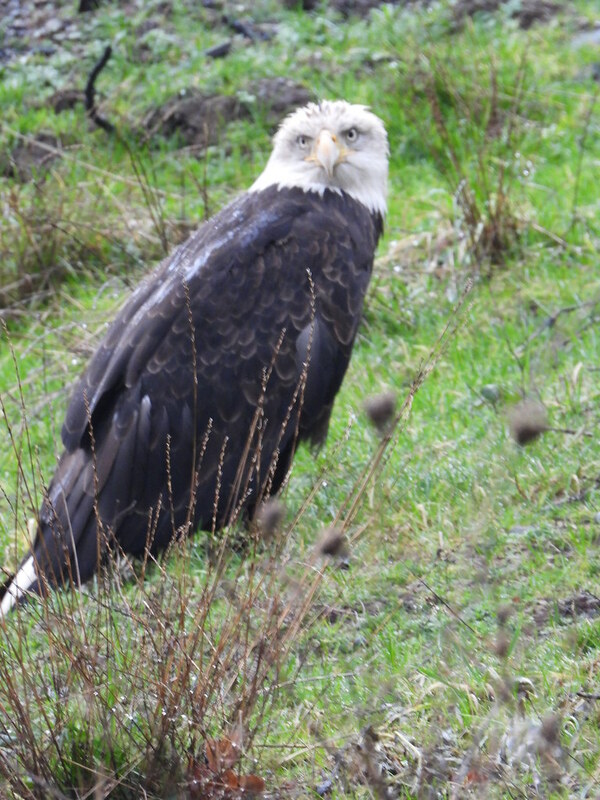 He was already pulled over next to the road, just before Phipps Point, & i could see the neighbours who had spotted the Eagle, walking towards us. One of them spotted the Eagle near the new house over to our left. So, the four of us went in, one wearing good long gloves, two with towels, & one with the big net. Aaron was game to do the capture. He went up behind the Eagle with the net. Us three were to circle around & distract from the front. The Eagle was not budging an inch from where they were. We all got within ten feet of the Eagle when suddenly the Eagle bolted to my left & away from Aaron. We almost trapped them up against a shed, but they bolted into the blackberry bushes at the last minute. The two guys dove in there as the Eagle tried to go in there deeper. After a bit of a struggle, Aaron was able to wrap the Eagle in a towel. He said the Eagle was very light & put up very little struggle. They were making a bit of a growly noise, which i have never heard before. We all walked back to Aaron*s truck in which he*d put the kennel that i*d lined with a towel & covered with a blanket, ahead of time, with the door open, ready to go. Eagle is in the kennel now. We called NIWRA & Tawny answered & was thrilled we*d captured the Eagle. Aaron was heading into town tomorrow anyway, so he was willing to go today instead, to bring the Eagle in right away. He asked if it was okay to bring the Eagle to MARS instead, & Tawny said that would be fine. So, Eagle & Aaron were on the noon ferry & should be at MARS by now. Here are some assessment fotos i took. This Eagle is in the last phase of sub-adulthood. Checking out the shed & bushes to which they*d would run when we got too close. So, Joanne from MARS called me to get a bit more information about our Eagle. She referred to her as she. She weighed only 3.5 kg, & should weigh much more than that. She definitely has something going on with her breathing, either trichomonas or aspergillosis. So that is why she sounded like she was growling. i have never heard that before. They took a swab & are treating her for both. If she can survive what is going on with the breathing, it will be easy to get her weight back up. She is getting extra oxygen piped into her cage. She was given a tubing of the stuff to kick start her crop. Joanne says they are getting other Eagles with this symptom. This Eagle was number 016 & we*re only halfway through january. She said that there are a lot of hungry Eagles at MARS. 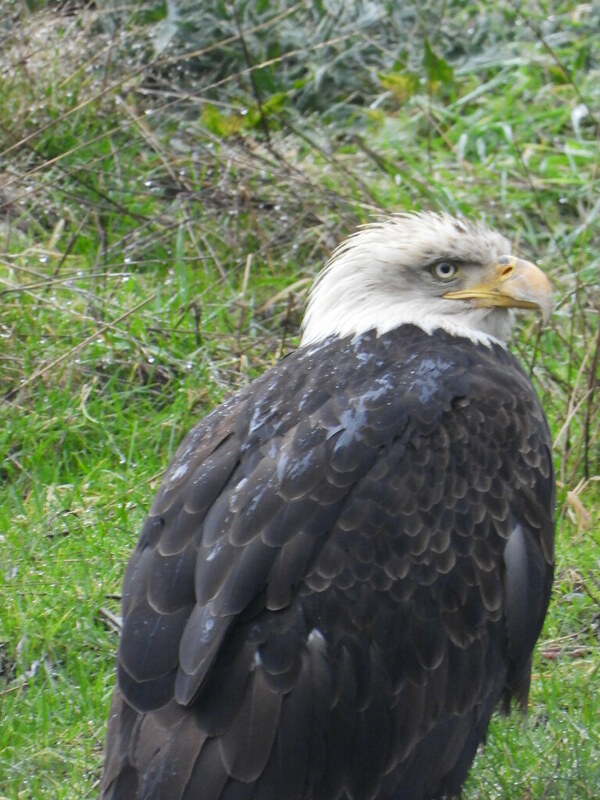 People on Hornby are seeing 30-50 Eagles feeding on a dead Sea Lion in Helliwell Park right now. Someone just sent me this link from CHEK News. The video part has an obvious mistake. 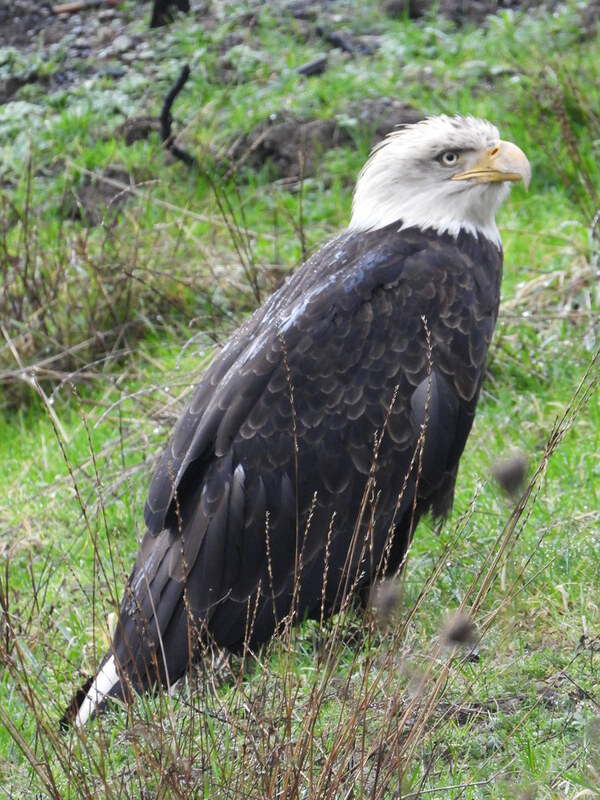 It makes it sound as if the eagle that Booni and Aaron rescued yesterday was Mom Hornby, or Em! We of course know that this rescued eagle is a sub-adult and has not 'bred for many years'; also she was found at Phipps Point. The video shows nice views of that eagle, and gives us the strange respiratory sounds of two different eagles affected by this respiratory disease. One of the sounds is the strange growl that Booni described. Click here to see the video and accompanying article. Sadly. Sorry the eagle didn't make it. grrrr use of lead in shot, bullets, fishing gear (weights) is totally infuriating! So true Raj, and yes Thanks for doing the best you could for her. Also thanks for keeping us up to date and informing us on your rescues. Very sad that they have to deal with lead in their food, they are just trying to do what they do to find food.